This well-maintained 4-bedroom, 3.5-bathroom home underwent extensive renovations and remodeling in 2005, converting what was a ranch into a colonial. In 2015, a layout issue was rectified so the second floor now includes the master suite with full bath, along with two more spacious bedrooms and a second full bath. 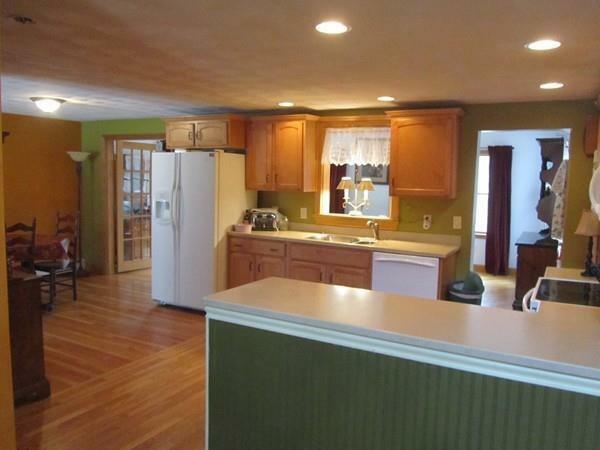 The home boasts hardwood floors throughout (except in bathrooms). Corian counters as well as recessed lighting adorn the kitchen which flows nicely into the dining room and living room. A unique floor plan - including laundry on both the first and second floors - would allow the home to easily be used as a 5 or even 6 bedroom home. The first floor bath (with handicap shower unit), laundry room and bedroom could easily be converted into a second master suite. The home is located on a lightly traveled road and the lot abuts more than 70 acres of conservation land! There is ample storage in the partially finished basement, garage and storage shed. Easy highway access.